Sports and physical activity generally play a significant part in the school experience for many American kids. While there are benefits to involving a child in organized sports programs, there could also be negative drawbacks. Supervise and monitor your child’s sporting experience to ensure that the positives outweigh the negatives. 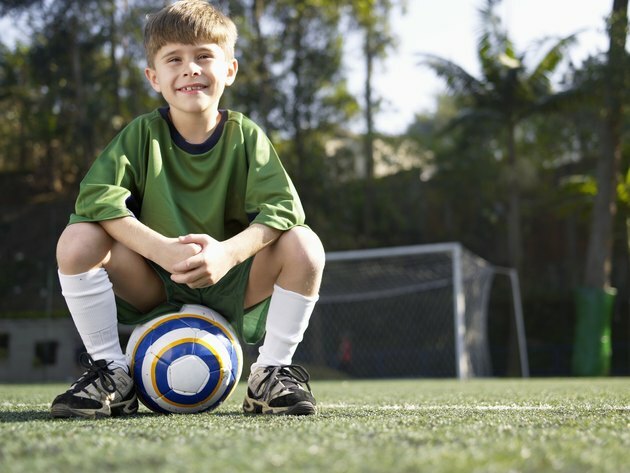 A child participating in school sports stands to gain important psychological benefits, according to Marianne Engle, sports psychologist and clinical assistant professor, with the New York University Child Study Center. Kids playing sports may have reduced anxiety and depression. Children can also receive self-esteem boosts, which may improve confidence and school performance. Youngsters who play sports in school often enjoy enhanced social interaction, reports the National Association for Sport and Physical Education. The socialization that occurs with organized sports can help a youngster learn effective skills for interacting with both peers and adults. The peer culture that surrounds organized sports often plays an important role in the school environment. When a child feels integrated into this environment, her school performance may become stronger. Sports can provide your youngster with a variety of character-building experiences, according to the American Academy of Child & Adolescent Psychiatry. Kids can learn valuable lessons about how to cooperate with others and play fairly. A child can also develop strong self-discipline as he strives to learn and excel at a sport. If the youngster uses this self-discipline academically, he may improve school performance. Sports participation may enhance critical-thinking and problem-solving skills, too. Children need daily physical activity to stay healthy and strong, advises the Centers for Disease Control and Prevention. With participation in sports, your child could become stronger, increase endurance, build healthy muscles and bones and control weight. Kids who feel overwhelmed or tense with academic issues might benefit from the physical activity involved with sports activities. After running off negative anxiety and tension, your youngster might feel more able to concentrate on school. These physical benefits often have a direct impact on emotional well-being, which can improve a child’s school performance. Although there are many benefits of sports participation, stay vigilant for possible negatives that could occur. The focus of sports participation should center on learning skills, developing teamwork and having fun. If a focus turns toward unhealthy competition, the experience could become negative, warns Engle. Your ongoing involvement can ensure that your child keeps sports participation in perspective to keep it positive. New York University Child Study Center: Sports and Kids: Pathway to Healthy Development or to Unhealthy Competition?